Lying in the heart of the Visayas, Bohol is home to the exotic Chocolate Hills, pristine beaches, hidden coves, friendly people and fantastic dive sites. The unspoilt paradise island of Panglao, with its beautiful white sand beaches, is connected to Bohol by two short bridges. The island of Bohol lies some 80 km to the south-east of Cebu City, and approximately 800 km to the south-east of Manila. Bohol has its own small airport in Tagbilaran City, with several daily connections from and to Manila as well as Cebu. To Cebu there is also a ferry service, with several daily ferry and express fast craft services, which land and leave at the city pier of Tagbilaran. Bohol, in the heart of Central Visayas, is the 10th largest island in the Philippines. Bohol is the Heritage Province, the eco-cultural tourism destination of the 21st century. Aside from its pristine white-sand beaches and the Chocolate Hills, Bohol’s tourism assets also include centuries-old churches and towers, scuba diving havens, majestic falls and caves and historical landmarks as well as primitive and exotic fauna and flora. Different tourist destination sites have been developed by the Government to boost this industry. The island is ideal for all types of diving. There are dive sites with gentle slopes, magnificent walls, a wide variety of marine creatures and limitless photographic possibilities. To see the best attractions of Bohol, and enjoy more the beauty of the island and the hospitality of its people, you need to stay at least a couple of weeks in our vacation house and experience the life in Panglao Villa. 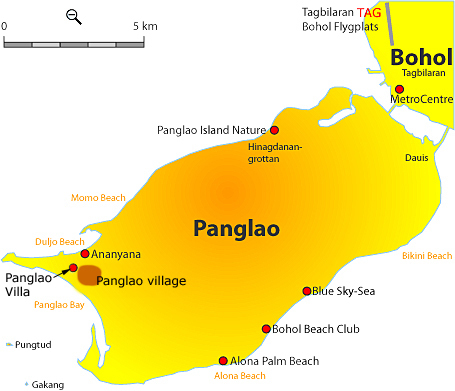 Panglao Island is connected to Bohol by two bridges of just 50 meters in length. Panglao is a 4th class municipality in the province of Bohol, Philippines. According to the 2000 census, it has a population of 21,337 people in 3,890 households. Panglao is famous for its white sand beaches and world class diving locations. Panglao has a terrain that includes plains, hills and mountains. Panglao is made of maribojoc limestone, the youngest of the limestone units found in the western area of Bohol. Biologists working in the Philippines have discovered thousands of new species of sea snails, crabs and other crustaceans and mollusks. The Panglao Marine Biodiversity Project made their discovery from 2004 to 2005 in the waters near Panglao island About 250 new species of crustaceans and 2500 new species of mollusks were found around the island. It is claimed that Panglao alone has more marine biodiversity than Japan and the Mediterranean sea. Historical Background: In early history, Panglao was known to Chinese, Malay, Siamese and Indonesian traders. In 1803, Spanish explorers came to the shores of Panglao in search of fresh water. At the time a couple of natives on the seashore were making fishing devices called “panggaw”. One of the Spaniards asked what the name of the island was. The natives, who thought the visitors were asking what they were making, replied “panggaw”. 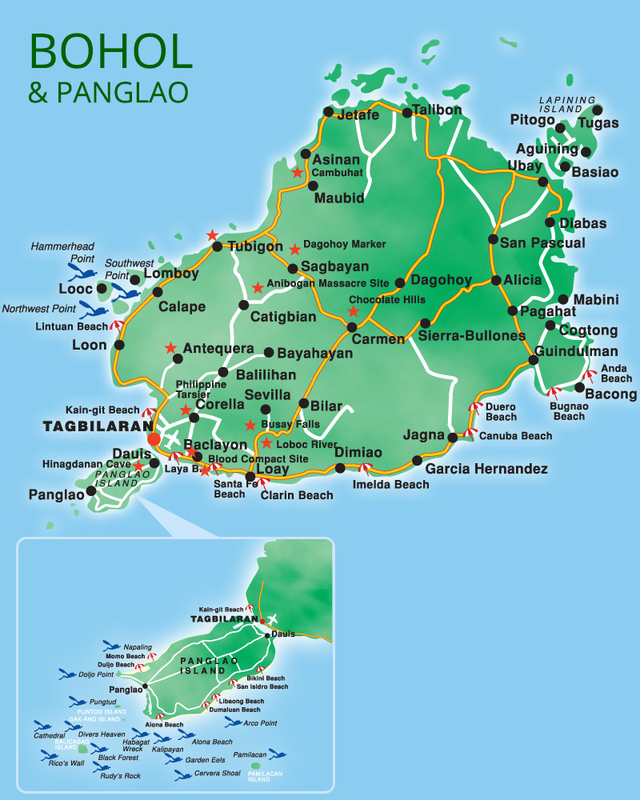 Hence, from that term, was derived the name Panglao.